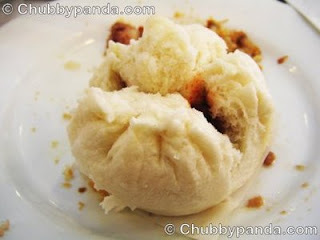 My first attempt to make cha shao bao a couple years ago didn't work too well, because I didn't know that the dough for bao should have an addition of starch, to lower the gluten content. Also, my using unbleached flour didn't help. Mix all dry ingredients but the yeast together. Proof yeast in water, add to ingredients. Mix well, knead slightly (don't want to develop the gluten). Rise in refrigerator for about 8 hours. (Refrigerator rising/cool rising gives a more even texture, and works better for those with busy schedules. The cold slows the yeast's activity, allowing for more flavor and an interesting texture to develop.) You can either do the first rise at room temperature, and do the second rise in the fridge overnight OR do the rise in the fridge, remove and warm up to RT, check for doneness (2 finger poke method). If indentations remain, dough is ready to be used. If not, go through with the second rise at room temperature. Take out from fridge, warm up for 2 hours before using. Steam for a couple minutes at high heat. Don't forget to add that red dot with food coloring! You can also infuse the dumplings with a tea aroma by adding a tea bag into the boiling water below, but that would probably go better with shau mai or xia jiao. Here are the dry ingredients before mixing. All white colors here. Here's the Wei Chuan brand bamboo steamer from my mom; line the interior with Napa cabbage. During steaming action. They only need a few minutes, since the meat was already cooked previously. Final product. I think it turned out pretty well. The pleats could be a little tighter as you can see, but pretty successful.